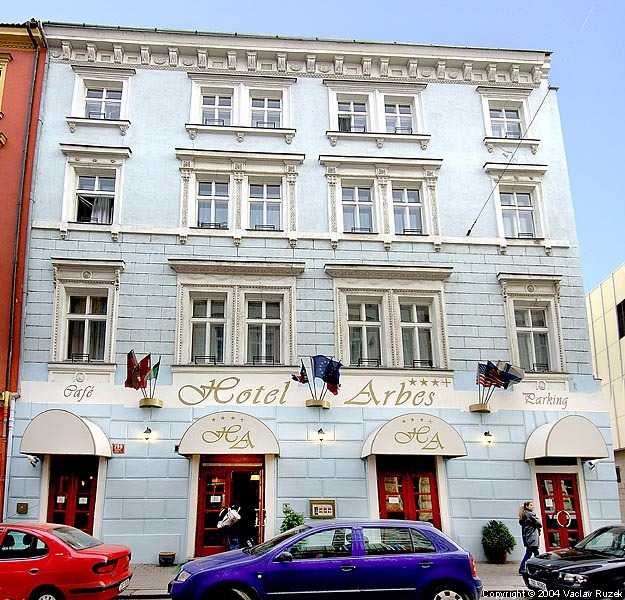 The Hotel ARBES *** is very conveniently located near Arbes Square in the centre of Prague on the border of two Prague districts, Smichov (Prague 5) and Mala Strana (Prague 1) in the historical centre of Prague. Situated below Petrin hill and Prague Castle and on the left bank of the Vltava River, it is a short stroll to Charles Bridge or to the National Theatre (both approx. 12 minutes). 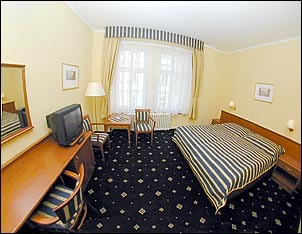 A tram stop is very close to the hotel and the underground station Andel - line B - is 3 minutes walk from the hotel. The hotel is suitable for both business and tourist clients and has a total capacity of 27 rooms (62 beds in singles, doubles, triples) on four floors. It was completely rebuilt from the original residential building in 1992. After 8 years of successful operation, the hotel undertook at the beginning of 2001 complete and intensive reconstruction of two floors with 13 rooms, as well as a total reconstruction of the hotel ground floor. 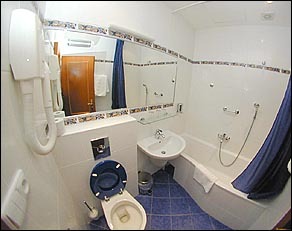 All 27 rooms were upgraded to ***+ standard. 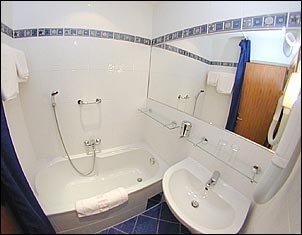 Every room is equipped with new period-style furniture, mini-bar, satellite TV, phone, safe and modern style en-suite bathrooms equipped with bathtub, shower, toilet and hairdryer. A tasteful, attractive style of decoration has been used throughout, which enhances the modern conveniences provided for our guests' comfort. A pleasant surprise awaits downstairs. There is a delightful, cosy wine cellar restaurant that serves an extensive buffet breakfast and also, upon request, serves Czech and International cuisine for reserved groups with a wide range of local and foreign wines, Czech beers and soft drinks. 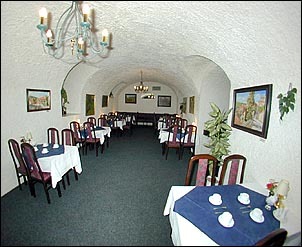 The wine cellar may also be used for meetings and classes. A new reception desk and lobby bar were created in an enlarged but cosy reception hall. Complete with a new fireplace and coffee tables with comfortable armchairs for enjoying drinks from the hotel bar, it provides a welcome upon entering from the street. 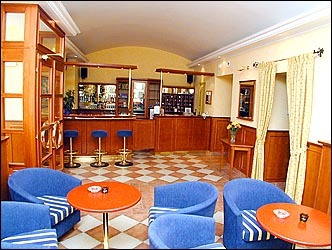 The lobby bar is opened from 9 a.m. till 2 a.m. and offers a wide choice of alcoholic and soft drinks. Furthermore, a new lounge hall is available for guests wishing to relax. It is furnished with comfortable sofas and armchairs and decorated with pictures of old Prague, Bohemian Crystal and handmade painted glass. The modern, stylish furnishings create an ambience suitable for guests wishing to read, hold meetings, conduct appointments or simply wishing to watch TV or to listen to music from the lobby CD player. It is located behind the lobby. 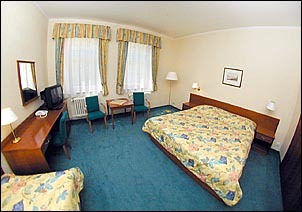 The Hotel offers many services such as: 24 hour reception, exchange services, payment by VISA, EC/MC and AMEX. A lockable, private car park is available in the hotel courtyard. We offer 15% discount for reservations prepaid in advance - rate Advance Purchase.